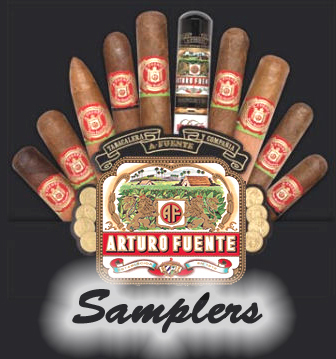 Arturo Fuente...what name better exemplifies the finest premium cigars in the world? The Fuente family's tobacco roots go back to the old world of nineteenth century Cuba. Born in 1887, Arturo Fuente learned the art of cultivating top quality tobacco and manufacturing handmade cigars from his father in Cuba. After immigrating to the United States and finally settling in Tampa, Arturo rolled his first cigar bearing the Fuente family name. Arturo Fuente is still a family company after all these years, representing four generations of family tradition, and is internationally recognized as the world's finest cigar maker. Treat yourself to a truly exceptional cigar experience.... enjoy a sampling of the world's finest cigars while also saving a bundle during this special Fuente Sale! 2 Hemingway "Work Of Art"
With the overwhelming response to this Arturo Fuente Sampler, individual samplers may be changed periodically to meet inventories. Please be sure to review the sampler you wish to purchase just before placing your order.